Shipov was answering questions posed by members of Crestbook’s Russian KC-forum, and the end result was a comprehensive account of the year. Topics ranged from the best games and moves to chess politics, with Shipov explaining why Kirsan Ilyumzhinov should go but Garry Kasparov shouldn’t replace him. 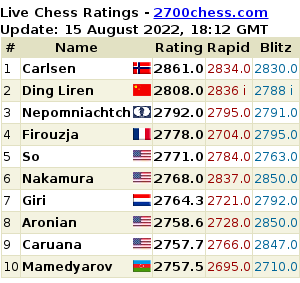 Carlsen’s current rating achievements really are comparable to Kasparov’s peak, despite the significant rating inflation. Yes, the gap between Kasparov and the elite of his own day was greater, but at the time there weren’t as many strong programs to help with preparation as there are nowadays. The computer, like the Colt in the Wild West, has levelled the strength of the rivals. In our day it’s become harder to break clear of your pursuers. 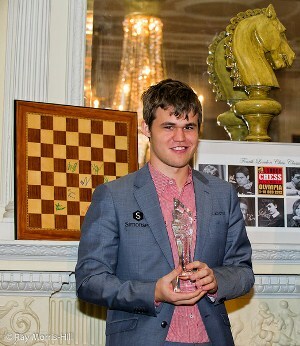 That makes Carlsen’s achievements all the more impressive. He’s Kasparov’s heir – not Kramnik, Topalov or Anand – because he’s managed to become not simply the first among equals, but objectively and unquestionably the best. All that’s left is a trifle – winning the title. Otherwise years from now Magnus’ current achievements will be almost forgotten. Incidentally, I don’t consider Carlsen weak in the opening. It’s simply that instead of following the fashionable lines he seeks out his own paths. He skilfully chooses systems that come as a surprise to his opponents. Everyone has their own style. Their own strategy. Their own approach. I really don’t see any weaknesses in the Norwegian’s play. He’s absolutely universal. The current Carlsen is the Spassky of the 60s, reinforced with all the chess knowledge accumulated over the last half century. On whether Carlsen can cross the 2900 mark in 2013? That largely depends on the speed of rating inflation. If the people Magnus can play a simultaneous display against become 2700 players, then why not? But in the current state of affairs – unlikely. On whether Carlsen is destined to win the Candidates Tournament? I’m reminded of Agatha Christie’s wonderful work “The Murder of Roger Ackroyd”. All the facts and all the clues pointed to Ralph Paton being the guilty man. But that was precisely why Hercule Poirot assumed Ralph wasn’t the murderer. It’s the same here. Everything suggests Carlsen will win: his huge rating, convincing play, the energy of youth, the tournament format, the weaknesses of his rivals. But it’s precisely that predestination that forces me to doubt Magnus’ success. The sense of the inevitability of his upcoming success could play a cruel trick on the Norwegian. That’s happened more than once before with his predecessors. And Carlsen’s rivals, who no-one expects to win, will find it correspondingly easier to play. The weight of responsibility will be much lighter on them. So while assessing the probabilities I’ll be careful. Yes, Magnus is the favourite, but not the sole and absolute favourite. Aronian, Kramnik and some third guy in dark clothes will also have real chances. Don’t miss the full text at Crestbook! Thank you Mishanp! Fascinating read. I miss having chess commantary at that level in the English speaking world. In particular I’m impressed by his optimism and evident love of chess. He’s not afraid of computers and of the alleged draw death. He goes as far as saying that even solving chess mathematically (which experts say will not happen in our lifetime) would not kill the game as a competitive sport. But would we still be interested in it to the same extent? What’s more important, the objective evaluation of a position or the subjective possibility that a player would make mistake in that position? Shipov says in this review, clearly the latter, but it is a controversial thing to say. At the present time, we are interested in both. 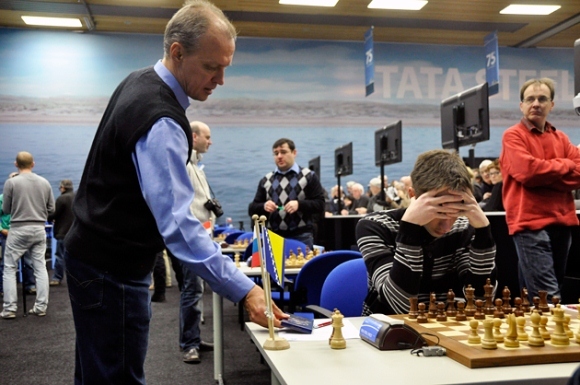 If chess will be solved – there would be no post-game analysis, since all the answers about each position will already be known, so there will be loss of interest in my opinion. Regarding Carlsen and the world championship: he doesn’t refer to the wide-spread opinion that Carlsen’s style of play (and opening preparation) is very much suited for tournaments, and hasn’t been challenged in a one-on-one match. If you have a chance to speak with him, I wonder what he would say about it. I am happy you are back! One can’t live on TWIC, Chessbase and Chessvibes (with all its silly trolls) alone. Chess in Translation (and Chessmind) are informative, serious, and fun to read. Thanks! Will Shipov be commenting on the Candidates ? Yes, but in Russian for the ChessTV live coverage: http://chesstv.com/en/schedule He might also be writing some short reports on each round, probably for one of the many official websites: http://candidates2013.com/, http://worldchess.com/candidates/index.html or http://london2013.fide.com/ It seems even the people involved in producing the live coverage didn’t know what was going to happen until the very last moment.